Why Won't My Rose Bush Bloom? Does Artificial Light on Rose Plants Make Them Grow Better? Rose bushes are always a good choice for a garden. If planted correctly, they'll flower the first year. There are two ways to plant them: the barefoot method (roots are exposed) or the container method (roots are not exposed). As the roots need to be soaked prior to planting, place the barefoot rose bush in a tub of water for 12 hours. If the rose bush is big, dig a hole 18 inches in diameter by 18 inches deep. If the rose bush is small, such as a miniature, dig a hole 12 inches in diameter by 14 inches deep. After digging the hole, use some of the soil to make an upright cone in the hole. Take the rose bush out of the water and place the roots on the sides of the cone. Spread the roots out without pulling on them. The bud union must be an inch above the ground. Mix some compost in the soil that was dug out of the hole. Shovel the dirt back into the hole and pat down. Place some mulch around the bud of the rose bush and water. Water the container rose bush the night before planting. Dig a hole two to four inches larger than the root ball. Gently remove the rose bush from its container, and keep the root ball undisturbed. Place the root ball in the hole. The bud union must be level with the ground. Add compost to the soil that was dug out and mix. Water the rose bush and shovel the soil back into the hole and water one more time. Place at least two to four inches of mulch around the base of the rose bush. A rose plant’s structure (from the bottom up) consists of the anchor roots, shank, bud union, canes and budeyes. A good root system is necessary for the plant to grow, as the roots carry water and nutrients to the plant. Older (mature) rose plants will have developed a large root system. The shank of the rose plant is part of the root stock, and it is from the shank that the bud union is formed. The shank and the roots support the above-ground structure of the rose plant. The bud union is formed at the top of the shank, and it is bulbous in shape. It is an important part of the rose plant, as the canes grow from the bud union. Canes grow upward from the bud union, and it is from the canes that leaves and roses are produced. Budeyes are located in close proximity to where the leaves are attached to the canes. The budeyes are the sites that will produce new canes. Pull on your gardening gloves and make sure that your shears are clean and sharp. Look the rose bush over to find any blooms that have faded and begun to turn brown. Cut the stem back about eight to ten inches from the faded bloom. Make the cut at about a 45-degree angle at about one-fourth inch above a side shoot, a cluster of leaves growing from a bud. This will produce a flush of healthy new growth. Collect cut stems and toss them on the compost heap. Discarded plant material lying around the garden can attract unwanted fungus and insect pests. Sprinkle the area with water. Wet the soil around the rose bush. Never apply fertilizer to dry soil. The dampness will help hold the fertilizer in place. Spread a half to 1 cup of general-purpose fertilizer like 10-10-10 or 12-12-12 around the rose bush. Start with a circle 6 inches from the crown of the rose bush and spread out to a distance of 18 inches. Do not sprinkle fertilizer directly on the rose bush because it will cause burns on the plant. Scratch the fertilizer into the surface of the soil with a cultivator, which looks like a small hand rake. Go to the depth of about a half inch. Water the area thoroughly. Fertilizer needs water to activate and be able to reach the roots of the rose bush. Gently soak the area so you do not blast the fertilizer away from the rose bush. Repeat the fertilizing process again at the beginning of summer between mid-June and mid-July. The Wild Rose is a shrub that can grow from 2 to 5 feet tall. The flowers have five petals and can come in shades from white to dark rose. It grows in clusters. The Wild Rose flower is hardy is USDA zones 4 to 10, all but the very coldest climates in the continental United States. The Wild Rose flower is often seen growing by rivers, on prairies and in the woods at elevations of 3,500 to 7,500 feet. It can grow in partial shade or full sun and likes fertile, well-drained clay loam, sandy loam, or sandy soils. Wild game use the Wild Rose for food. The rose hips, the part that is left after the flower dies, is a source of vitamins A and C and are used to make an herbal tea. The Wild Rose flower is susceptible to the same diseases and insects as all other roses. The most common problems are aphids, black spot, rust and powdery mildew. Don your garden gloves and cut back the rose bush until there are just a few large strong canes remaining. Cut each remaining cane to about 10 to 12-inches long so it is easy to grasp with both hands. Dig down into the soil around what used to be the drip line of the rose. Use the shovel to cut a circumference line around the main root ball. Dig down in circles until you can get your shovel under the main roots. Use your shovel as a lever to lift the rose up and out of the soil. When sufficiently loosened by levering, grasp the canes with both hands and pull up and away using your body weight as leverage. Dig up and gather the remaining ancillary roots in the soil and discard. Roses will fail to produce blooms if they are not receiving an adequate amount of sunlight. At minimum, roses need six hours of full sun every day. If your rose bush is in a spot that is too shady to provide this amount of sun, move it to a brighter location. Roses need soil rich in nitrogen, phosphorous and potassium. If your roses aren't blooming, it is possible that your soil might be deficient in these nutrients. Use a fertilizer such as 10-10-10 or 10-20-10 to be sure they're getting the amount they need. Nitrogen is an important nutrient necessary for a rose bush to thrive, but too much of it will cause problems. When plants are receiving an excess of nitrogen, they tend to produce more greenery and fewer flowers. If you are currently using a fertilizer with high nitrogen content, such as 30-10-10, try switching to one with a lower amount. The first number represents the nitrogen content, so you should look for one with a number of 10 or less for nitrogen. Put on protective clothing, gloves and eye wear before starting the job of getting rid of rose bushes. Cut back the rose bush with pruning shears, making the cut sections 2 to 3 feet long. Tie the pruned canes into manageable bundles using twine. Remove as much of the rose bush canes as possible to better expose the shank of the rose bush. Dispose of the pruned branches before digging up the roots to clear the work area. Dig the root ball out using a shovel. A large root system may be divided and removed in two or three sections. The root ball is made up of two types of roots--anchor roots hold the bush upright while feeder roots spread out and gather nutrients for the rose bush. Feel around the hole where the root ball was growing to ensure no anchor roots or large feeder roots were left in the ground. Keep the protective gloves on during this process. Remove any roots left behind. Fill the vacant hole with potting soil to avoid a depression in the yard. 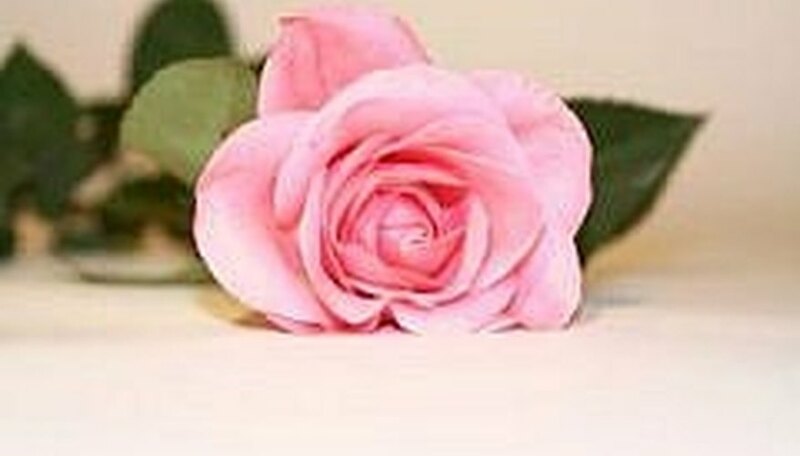 According to Rose Magazine, when removing an old rose bush to plant a new rose, it is necessary to use new soil for which to grow the incoming rose. Lay a square-shaped length of cellophane wrap on a flat surface. Allow at least a 30-inch square for the average long stem rose. 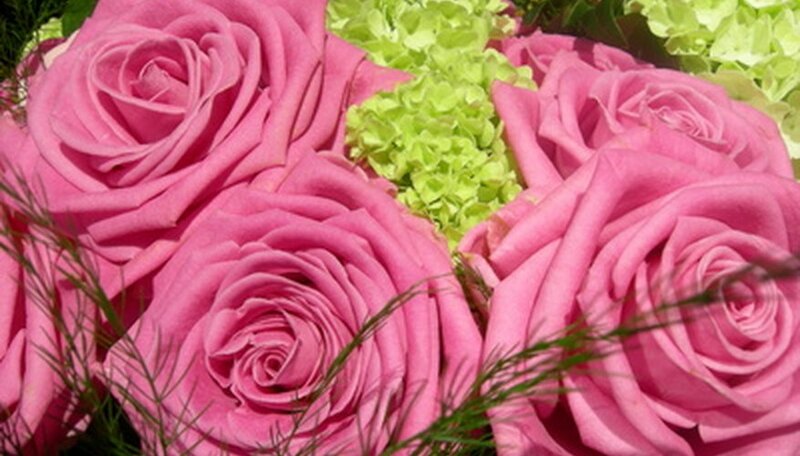 A smaller size piece can be used for shorter stemmed roses. Place green leafy material, such as lemon leaf or fern, and any filler flowers, such as baby's breath, if desired, onto the center of the square on a bias angle. Lay the rose stem on top of the greens at the same angle, with the flower head positioned a few inches below the very top tip of the greens. Wrap one half of the cellophane square over the stems and turn up the bottom of the cellophane to wrap the bottom of the stem snugly. Gently roll the bouquet toward the other half of the cellophane, wrapping the bouquet into roughly a cone shape. Wrap a foot or longer length of ribbon in the mid-point of the bouquet, tying a knot and then a bow. Trim the ends of the ribbon to length and finish with a bias or v-shaped cut on each end of the ribbon. Examine rose bushes for rose hips in late fall after all blooms have faded. Rose hips develop the best flavor once they have been touched by frost. Look for small rounded fruit that looks like a tiny apple. Most are red or reddish-orange, but some rose hips are golden or scarlet. Color depends on the cultivar. Gently squeeze the fruit between your thumb and forefinger. If the fruit is soft, it is ripe. Cut off all the above-ground rose canes down to the crown of the plant with loppers. Gather the cuttings from the soil surface and compost or discard them. Dig around the root ball of the rose with your shovel or spade to expose the crown and main root mass of the rose. Dig deep enough to be able to slip your shovel or spade under the main root mass of the rose. Don your garden gloves and grasp the crown of the rose with both hands and use your body weight to pull the plant up and out of the soil. Excavate more deeply if the crown and main roots do not pull out easily and pull again until the mass is released from the soil. Excavate and pull any remaining pieces of root material from the soil and smooth the soil down to level. A shrubby, multi-stemmed and flowering perennial in the warmer reaches of its growing zone (7 through 9), the confederate rose grows to a height of 15 feet and spreads to 10 feet. The large, deeply lobed leaves are bright green. In winter, the confederate rose drops its leaves in the cooler growing zones. The leaves are 5 to 7 inches wide. In late summer, the confederate rose produces large, showy flowers that are 3 to 5 inches wide. They open as white blossoms. Over a three-day period, they change to pink then blue-white as they die back. The confederate rose is adaptable and requires little maintenance. It is drought-tolerant and grows well in full sun or partial shade. Confederate rose roots easily from cuttings. If planted in very early spring, the confederate rose will produce flowers its first year. Rose bushes affected with canker develop sunken red or brown spots that eventually grow to envelop the entire rose cane. Once the cane is girdled by the canker, nutrients can no longer reach the leaves or blossoms, which will begin to wilt and eventually drop. To get rid of canker, prune the infected cane just below the canker. In its initial stages, rust fungus covers the underside of rose bush leaves in a powdery, rust-colored coating. As the disease progresses, yellow or brown spots will appear on the surface of the leaves and they will begin to wilt before eventually dropping. Rust is best managed by pruning the affected leaves. Rose leaf curl causes new leaves to emerge smaller and less green than usual. As they grow, they appear wilted and curl downward. As the disease progresses, shoots will die back and the leaves will eventually drop. To control the disease, prune the affected leaves and treat the rose bush with a lime sulfur spray. The Barbra Streisand rose bush produces large lavender flowers with a citrus scent. With attractive, dark green leaves, a hybrid tea rose bush that produces long stem roses suitable for cutting. It is named after the famous singer and director, Barbra Streisand. The Barbra Streisand rose is suitable for planting in USDA horticultural zones 5-9. The Paradise Rose bush is a hybrid tea rose bush that produces large fragrant blossoms with lavender inner petals surrounded by darker petals. The outer petals of the rose blooms become darkest lavender when the bush is planted in full sun. The Paradise Rose bush is suitable for planting in USDA horticultural zones 5-9. 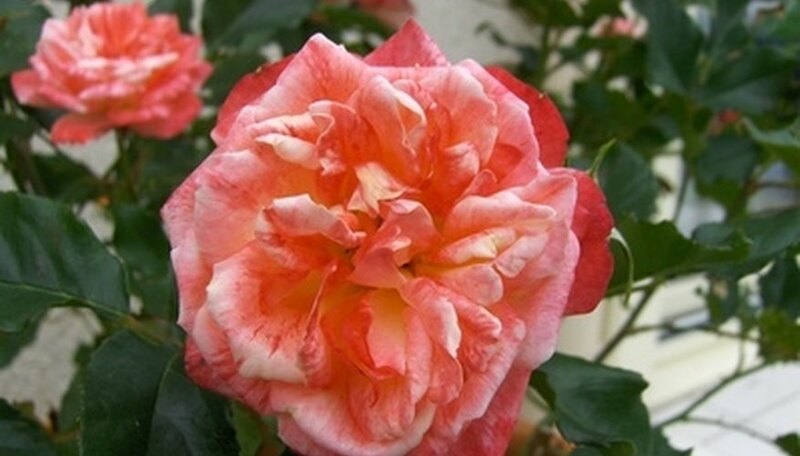 The Angel Face is a floribunda rose and has a spreading, low-growing growth habit. Instead of one bloom on each long stem like a hybrid tea rose, the Angel Face floribunda rose produces clusters of flowers on each stem and blooms several times throughout the growing season. It is a popular landscaping rose and is suitable for planting in USDA horticultural zones 5-9. The Melody Parfume rose bush produces long stemmed hybrid tea rose blooms. The flowers from a Melody Parfume rose bush have a strong citrus scent and are dark lavender. The Melody Parfume rose bush has a bushy upright growth habit and is suitable for planting in USDA horticultural zones 5-9. Artificial light on rose plants does not make them grow better than sunlight. Roses require an average of five to six hours of indirect sunlight for best growth. Select a rose garden location with morning sun and some afternoon shade, advises the University of Minnesota. Set up three stakes going around your rose tree. Place each one one-third of the way around the tree. Tie a piece of garden twine from the rose tree to the stake to keep the rose tree stable during any winter storms. The stakes also enable you to set a fence around the cane of the rose tree in step 3. Wrap a chicken wire fence around the rose tree, using the stakes for support to protect and insulate the roots and the cane of the rose tree. Since the cane is about 32 inches in length, you need a fence to hold the mulch in. Fill the inside of the chicken wire fence with mulch. Make sure it reaches to the top of the cane. The rose tree will survive the winter as long as you keep the roots and the cane warm with the mulch. 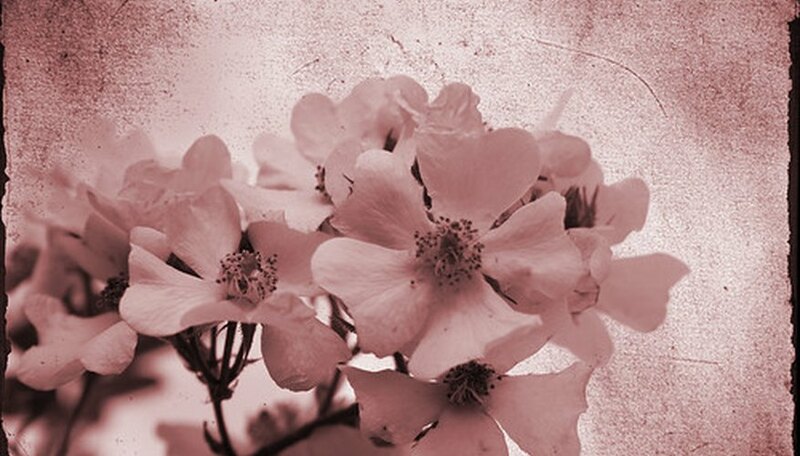 The wild rose has been around for over 30 million years. The Chinese were the first people to cultivate the rose. The Chinese used the rose for its medicinal effects. During Roman times, rose petals were used as confetti at parties. Hybrid teas were developed from the ever blooming teas. The climbing or rambling rose can be trained on a trellis, while other ramblers creep over the ground. The shrub roses grow to be 6 to 15 feet tall with thorns. Miniature roses have flowers no larger than a nickel. There is a significance to every color of the rose. A red rose means love. Lavender means love at first sight. White says, I miss you. Yellow roses congratulate the person you are sending the rose to. Pale pink roses mean gentleness or grace. Light pink means fun and happiness. Deep pink roses express gratitude. The most common disease of the rose bush is black spot, and its almost impossible to get rid of. Black spot is a circular spot on rose leaves that causes leaves to drop off. During hot summer months, powdery mildew, similar to a powdery white web, causes leaves to twist and become distorted. Rose rust causes the tops of leaves to become rusty and orange and is occasionally found on stems. Roses need at least an inch of water every week. Surround roses with banana peels once a month and apply a 1-inch thick layer of mulch all around the rose as far out as the stretch of the branches. Insects may bore holes into rose bush leaves, including leafcutter bees and Japanese beetles. Prune away injured leaves and stems, and spray the plant with insecticide. Gently place the wilted rose in cold water. Cut the end of rose on a slant with a sharp knife or scissors. Lay a plastic bag or plastic wrap flat on counter surface. Lay the rose in the center and place ice cubes all around both sides of the rose. Dab with a little water. Straighten the rose and use the ice cubes to keep it straight. Use paper towels to mop up water as ice melts. Rose should revive within a few hours or less. Shape rose bushes once new growth appears. Although you must use care not to remove flower buds, general shaping can be done any time when the plant is actively growing. Select branches or stems that extends beyond the overall shape of the plant for trimming. This includes overgrown, twisted or misshapen branches as they disrupt the overall appearance of your rose bush. Cut the branch on a 45-degree angle ¼ inch above a leaf node. The direction of the bud indicates the direction in which new growth will grow. To encourage growth toward the outside of the rose bush, cut above an outward facing bud. If the stem has two opposing leaf buds, remove one bud, leaving a leaf bud on the side where you want new growth to appear. Cut down multiflora rose bushes using long-handled branch loppers in early spring when new plants begin to emerge from seed beds and older plants begin photosynthesis. Treat the cut stems of multiflora roses with a post emergent herbicide such as Banvel or 2, 4-D. The remaining stems will take in the poison and pull it down to the roots, killing the rose plants. Grub up the roots of multiflora with a grub hoe and shovel. Large rose bushes may require heavy equipment such as a tractor to effectively break up the ground and remove the roots; you can rent such equipment from a heavy equipment store. You must get all of the roots out of the ground to prevent multiflora rose bushes from returning. Observe the location where you removed the multiflora bush and remove any new seedlings as they emerge from the ground. According to Ohio State University, a single multiflora rose bush may produce up to one-half million seeds per year that may remain viable for up to 20 years. Prune all infected rose leaves and blossoms. Bag and discard them far from your rose bushes. Wipe your pruning shears with an alcohol swab after each cut to prevent inadvertently spreading the fungus. Clear away plant debris or mulch from the base of the rose bushes. Bag it and trash it far from your rose bushes. Spray the rose bush with a fungicide in the dormant season. Strip all of the leaves and dead blossoms from the plant. Coat the plant's tissue with the fungicide, according to the manufacturer’s instructions. The fungicide does not kill existing fungi but will prevent it from taking hold the next season. Trim the rose bush after the leaves have fallen and after the first big frost of the season. Roses undergo a slight dormancy, which begins after the first frost. Remove all old and weak branches that are blocking essential sunlight to the healthy parts of the bush. Remove all dead branches and canes that rub against each other. Remove all suckers, or shoots found growing off the roots of the rose bush. Dig down to the base of the root and lift away the shoot where it emerges. Pruning them will only increase the number of suckers the following year, so make sure you remove the entire shoot. Cut all healthy branches down one-third of their length. Apply a coat of sealing compound to the open cut to prevent spreading disease and infection. Remove any green shoots that are less than the size of a pencil from the central stem of the rose bush to free up nutrients to the roots and central stem. Water before and after food application so the rose bush can absorb dissolved food nutrients throughout its root system. Choose organic fertilizer for early spring feeding. The University of Minnesota suggests well-rotted manure, bone meal or other organic materials that decompose slowly through the season. Use a water-soluble fertilizer for frequent, short-term feeding. Roses show new growth within a few days as the liquid fertilizer is quickly absorbed and used by the bush. Select controlled release fertilizers for simple application. This fertilizer dissolves slowly and is absorbed by the rose bush over 4 to 6 weeks. Apply organic mulch such as pine needles, peat, wood chips or shavings around the rose bush. The mulch keeps weeds down, retains soil moisture and slowly decomposes for added feeding. Apply the first food early in spring after pruning. Stop feeding your rose bushes in late summer or early fall before the dormant season.